What if I told you that there is an easy way of looking good, feeling good, and being energized all day? What if I said that losing weight and increasing energy levels is more straightforward, fast and convenient that you think? Remember those times in your life when you felt your best? And you had abundant energy all day? Can you remember when you genuinely liked what you saw in the mirror, people noticed it, and you loved yourself more than anyone else? Well, let me help you start feeling that way again! The first step is debunking some of the common myths that may be in your head that are blocking you from your results. MYTH #1 “It’s too hard.” Careful with your words… they are powerful! Instead of the “It’s too hard” try saying this: “It’s easy,” “Other people have done it and so can I,” “I’m smart… I’ll figure it out!” With that attitude, you are on your way! Also, anytime we start something new there is a learning curve. Baby steps, baby! Over time they will turn into automatic habits. Then when ready you can just add another habit on top and keep stacking them until you reach your goal! MYTH #2 “I have tried everything”: The reality is that if you had… “tried everything” then you would be at your ideal weight and you would have lots of energy because you would have figured it out. There is a simple way to do this, I will give you some tips on this blog POST. One size fits all it’s not to be applied when it comes to weight loss and energy, maybe you need a combination or a more custom plan for yourself. Just talk to any of us!. MYTH #3 “It’s too expensive”: You need to know where to invest your money! Your health is nothing to pinch pennies on. In the long run, aging healthy also save you big bucks, one of the primary reasons people get in debt is because of healthcare. Wouldn’t it be nice to invest early to retire with a good wealth of health? 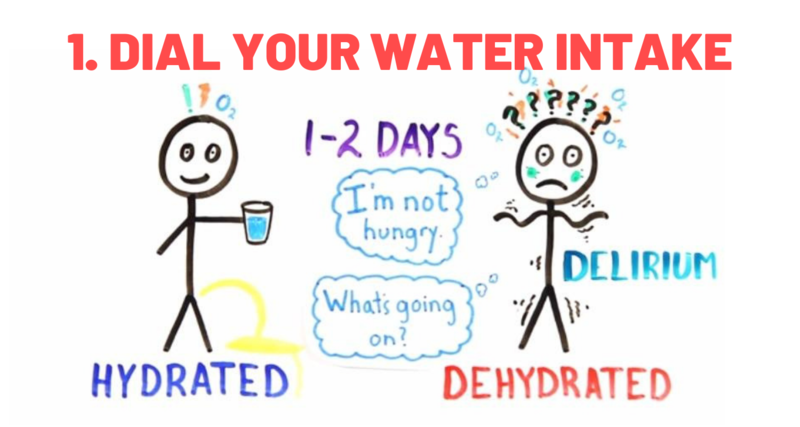 Most of us walk around dehydrated! We just don’t drink enough water for our bodies to function properly. The right amount of water to drink is half of your weight in ounces, but let’s keep it real, if your goal is to lose weight & boost your energy then you really need to take this seriously, and yes enjoy the side effects of a clearer, more radiant skin! The best time to drink water is as soon as you wake up, work your way up to drink 16-24 ounces first thing in the morning eventually. You will feel a boost of energy and will help you remove the waste of your body. You may also think that you are hungry when you are actually thirsty, drinking a glass of water before reaching for something to eat can help to curb unnecessary snacking and control cravings. Water also helps the body to recover from digestive problems, such as diarrhea, constipation, and indigestion. Remember we are 70% made of water! Staying hydrated is an excellent way to avoid retaining waste, which may add a few extra pounds. You may be carrying around 6-12 pounds of waste in your body, yep…the majority of us do, which not only affects weight loss and energy but overall health. The number one tool on the Daily Detox is water! 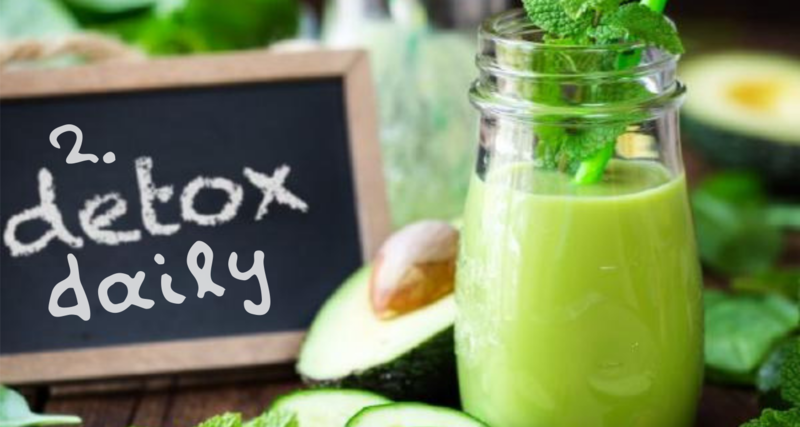 Doing a daily detox helps maintain a clean digestive tract, with proper elimination and is vital for weight loss and energy! Water is a major detoxifier of waste in the body when waste builds up, people may feel bloated, swollen, and tired. Bloating can add inches to a person’s waist among other health problems. Have you ever had that feeling of lightness and happiness after going number two? That is the feeling of a good digestive system which is easy to achieve through daily detox. This strategy is very important to keep momentum when losing weight, having mental clarity and feeling energized. Daily detox means lots of water, lots of fiber, no processed foods, a lot of raw fruits and veggies, etc. Will you always be eating perfect meals like those? Probably not, that’s why daily detox & gentle cleanse supplements are number two on the list for a daily detox and play a huge role in weight loss and energy. If you don’t give your body the proper nutrition is like putting diesel in a gasoline car; eventually, it will break down on you! The great news is that if you are mastering your water intake correctly, you are doing lots already. Hydrated cells absorb more nutrients, more nutrients in your cells mean less hunger because you are satisfied on a cellular level. 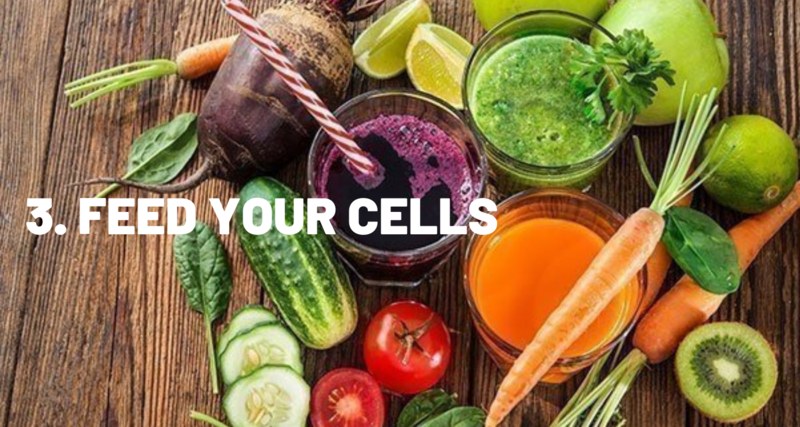 Now feeding your cells nutritious foods many times can be expensive, inaccessible, and too much work for a daily ritual, not to mention overpriced organic foods, lack of time and ideas to feed you and your family, etc. The best way to get an arrange of amazing nutrients, vitamins, and minerals and curb your appetite on a daily basis is from raw fruits, veggies, and superfoods, that brings excellent nutrition to your cells, that’s why a good daily nutritional supplements make life easier and convenient combining different beneficial foods from around the world in one serving to complement and help you with your healthy eating habits. Here’s why that’s bad: When your insulin is functioning well, fat cells remove fatty acids and fats from your bloodstream and prevent storage. When you become more insulin resistant, fats circulate in your blood and pump out more insulin. Eventually, this excess insulin ends up storing fat in all the wrong places, such as tissues like your liver. And this is exactly how you become fat and suffer from diseases like diabetes and fatty liver. Besides what happens with insulin, lack of sleep overall makes you tired, moody, your mind is not clear, and you make poor decisions about food and exercise. 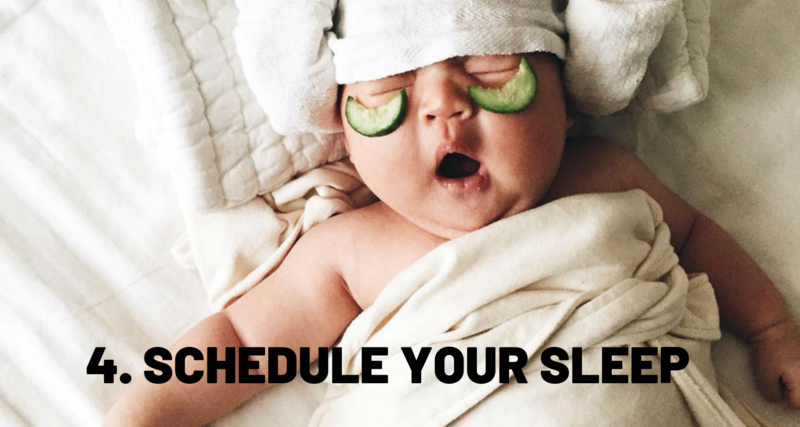 Don’t take sleep for granted, stick to a sleep schedule, you know the drill, go to bed at the same time, make your room pitch black, don’t drink liquids before bed that can wake you up at the middle of the night! Six to eight solid hours of sleep will change your life! There have never been more cases of obesity and overweight people than we have now! According to the most recent Behavioral Risk Factor Surveillance System (BRFSS) data, adult obesity rates now exceed 35% in seven states, 30% in 29 states and 25% in 48 states. So at least 1/4 of the country is obese, predicting 6 out of 10 children and teenagers to be overweight and obese by 2030. This is sad, and yes it is related to poor eating habits. It is very well known that sugar is directly related to obesity and being overweight. Sugar is in everything! Just take a quick peek at labels on any package from the store, one of the first ingredients will always be sugar! And yes sugar is one of the most addictive substances. Its only one molecule different than cocaine!!! 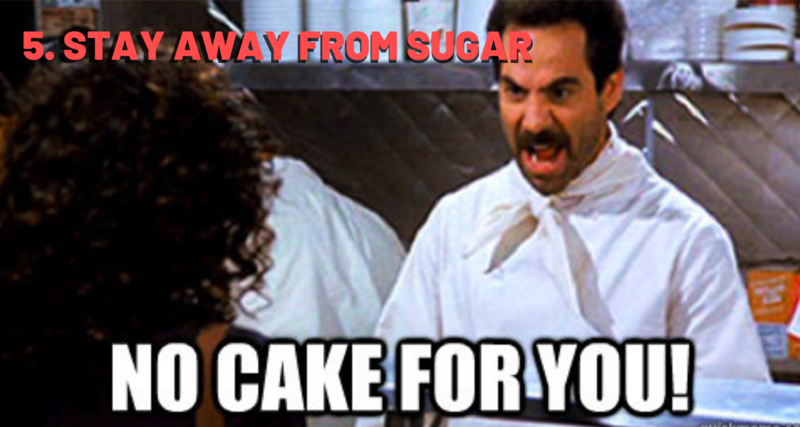 Long story short, sugars convert into fat! Consider all empty carbohydrates, all candy, pastries, soda, alcohol, and processed foods to be sugar. If your goal is to lose weight and increase energy, stay away from the aisles and do your shopping in the produce section! Pick your favorite fruits, or make something that will satisfy your sweet tooth at home. And please don’t be fooled by sweeteners, most of them are loaded with chemicals that don’t serve your body. Here are my recommendations for a sugar replacement: Stevita Brand Stevia (Alcohol-free) or monk fruit. Another way to win the battle with sugar (cravings or not) is again: Hydrating and Feeding your cells superfoods like chlorella and spirulina that are very well known to help regulate blood sugar and cravings. Keep in mind that “food” is very emotional. We attach a lot of feelings with food since the moment your mother reward or comfort you with food. We also have fond memories of food with special holidays and occasions such as Thanksgiving, Christmas, weddings and birthday celebrations. Food (good or bad) has been an important part of our social relationships. As an individual, you have developed your own relationship with food. Have you ever been in a job that you can’t wait to get out for the lunch break? Have you ever felt that you did something very good and immediately think about that particular food that you absolutely love as the grand prize? It happens all the time! The first step is finding out what your triggers are… Is it stress, anger, anxiety, or depression in a specific part of your life? Or, is the food your main reward when something good happens? Being aware and catching yourself in that critical moment is a massive step towards weight loss and empowerment to achieve your desired goals for weight loss and energy. No matter how you kick-start your weight loss, the best way to keep it off is with long-lasting lifestyle changes like conscious eating, detoxing daily, and physical activity. If you’re not sure where to start, what are the best natural supplements to take, what foods to cut out, or how to do it safely, you might want to sign up for a free 30-minute consultation ($97 value) with one of us.